For the last several years, much of the attention in particle physics has focused on the Higgs Boson, so one could be forgiven thinking that the rest of the subatomic particle world has been figured out. In reality, however, many open questions remain. The precise masses, decay rates and relationships among other particles—including mesons, quarks and gluons, which make up the protons, neutrons and electrons with which we're familiar—are a few of the topics that need further study. For four decades, a group of researchers called the MIMD Lattice Computation (MILC) Collaboration have been doing just that. MILC has been using many of the nation's most powerful supercomputers to simulate the conditions inside the nucleus of atoms and to quantify the masses and decay properties of still-mysterious particles. Specifically, they investigate a theory called quantum chromodynamics, or QCD, which describes the strong interactions of subatomic physics. First theorized by David Politzer, Frank Wilczek and David Gross in the early 1970s (for which they won the 2004 Nobel Prize in Physics), QCD is the fundamental theory that governs the interactions of quarks and gluons inside the nucleus of atoms. The MILC Collaboration uses large scale numerical simulations to study QCD. The most well established approach to solving the problems of the strong force is called lattice QCD, a numerical method that treats space and time as points on a grid or "lattice" and then models QCD on this grid. Simulating physical systems on a grid is employed in many disciplines, but unlike most, QCD requires that the theory obey a special symmetry, called gauge symmetry, which means that the force fields can be changed in certain ways at every point in space and time without changing the physics—a quality that gives rise to the perpetually-bound nature of quarks. These "lattice-gauge" theories, as they are called, have been incredibly effective at determining many important aspects of particle physics. As effective as lattice-gauge theories have been, solving QCD calculations efficiently and accurately has been a challenge. "There are two big problems," explained Robert Sugar, a member of the MILC Collaboration at the University of California, Santa Barbara. "You perform the calculations on a lattice or a grid, but the real physics is when the grid spacing goes down to zero." This is because the universe appears to be continuous and not discrete. "That's the bad news. The good news is, you actually know how various quantities behave as the lattice spacing goes to zero." This allows QCD theorists to extrapolate solutions. But to do so, requires major computing muscle. The second problem involves the quarks themselves. Quarks are not only almost impossible to perceive as individual components, the lightest ones—the ones that make up the protons and neutrons—are very light compared to all other mass scales of strongly interacting matter. "Until the last year or two, we couldn't perform simulations at the physical masses of the lightest quarks, we had to perform them at higher masses," Sugar said. "The great thing that's happened in the last couple of years is that as computers and the algorithms have gotten better, we can now do the simulations at the physical masses of the quarks. This was a major advance for the field." At the Large Hadron Collider (LHC), the spotlight has mainly focused on experiments run on two big detectors: Atlas and CMS. But there is also a smaller experiment called LHCb that is doing physics with charm and bottom quarks, which are an important component of the MILC Collaboration's work. "We have less data on particles containing charm and the bottom quarks than on those made up solely of lighter quarks. Learning more about the properties of this quarks is particularly important," he explained. "That's also the place where there's the most room for problems or contradictions with the Standard Model. The LHC and other accelerators are providing data on those reactions to compare with simulations." 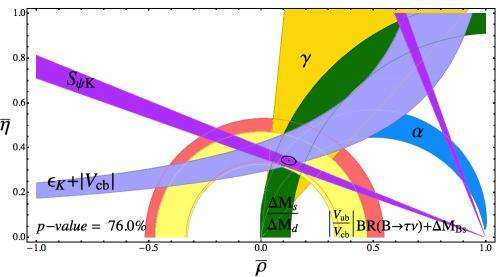 In a recent paper submitted to Arxiv, Sugar and his colleagues calculated the decay of kaons (or K mesons, a type of unstable particle composed of a strange quark and an up or down quark) using lattice QCD and working, for the first time, at the physical light-quark masses. The calculations served to check the Cabibbo-Kobayashi-Maskawa (CKM) matrix that underpins all quark flavor-changing interactions. The researchers were able to reduce the theoretical uncertainty in the first row of the CKM matrix in a way that sharpens the test of CKM unitarity—a restriction on the allowed evolution of quantum systems that ensures the sum of probabilities of all possible outcomes of any event is always one. "We're just beginning to get the first results from the simulations at the physical masses of the quarks," he said. "These simulations will enable us to determine decay properties of at least some of the strongly interacting particles to a precision which is beginning to rival that of experiment. We even have some cases where we performed calculations before the experimentalists, which is always good. Then the experimenters came in and showed we were right." "Lattice gauge theory is remarkably interdisciplinary," said Marc Sher, program director for Theoretical High-Energy Physics and Cosmology at the National Science Foundation. 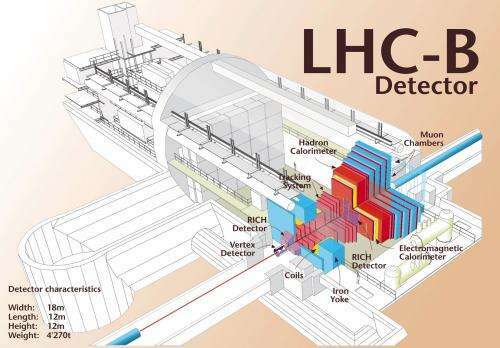 "It's critical for high energy collider physics, since high energy collider beams are composed of protons and antiprotons, and understanding proton structure is critical in extracting the results of these experiments. It's fundamental for nuclear physics, since all of nuclear structure depends on the strong interactions, whose study is the raison d'etre of lattice gauge theory. And it's important for computational physics, since large massively-parallel computation is needed." The results of the QCD simulations help to refine the parameters that go into the Standard Model, which, according to Sugar is "maddeningly successful." But they have another more revolutionary purpose. "One of the things we most want to do is make very accurate theoretical calculations and compare these with very accurate experiments to see if you can find places where new physics ideas are needed," Sugar said. "That's the holy grail because nobody believes that our present ideas are the last word." What might lie beyond the Standard Model is an open question. But most in the scientific community agree that the answer will only emerge from the careful, incremental investigations of particle interactions, both through experiments and numerical simulations. "Now is a really exciting time in QCD," Sugar said. "We believe that we are on the verge of making a lot of progress."